None came, and the group stepped into a large circular room. There was no furnishings in it. The walls were made of the same grey stone as the rest of the building and torch scones lined them, torches lit. However, most of the light that illuminated the room was from its center, where a large pedestal rose from the floor. On top of the pedestal was a rounded cage made of black steel with no door or lock. Within that cage was, without a doubt in Golarion, the Wardstone Fragment. When Shayliss had been imagining the fragment, her sense of scale for it was something that was palm size. Maybe large enough to be carried in two hands. However, looking at it now, she could not believe what she was seeing. The fragment was not something that could be carried by normal means. It was as large as her whole body and wider than her even if she was lying down. A surprised gasp turned her attention to the three forms standing in front of the pedestal. All three were demons. One was, at least at one point in life, a minotaur. It had the basic characteristics one might think of when they imagine a minotaur: massive horns that curled forward, a bull’s head, body and legs but a human’s arms, hands and ability to stand on two feet or hooves in their case. But that is where the resemblance to the mythical beast ended. Its fur, instead of being a flat brown, was a mismatch of reds and its eyes were a reptilian yellow. The horns had veins of power flowing through them and Shayliss was not sure if they moved or if was just her imagination. The second form, in between the minotaur and form number three, was a women whose long, rounded ears told Shayliss that she was a half-elf. And a pretty one too, before the Abyssal energy crippled her. Plate armor with a skull motif covered most of her body. Her left foot was not fully planted on the ground and it took Shayliss a second to see that it was bent at an unnatural angle, as if her ankle had broken and she was never able to put it in place before it healed. Her right arm was replaced by an insectoid limb that ended in three long, thin claws. Those claws were long enough to wrap around Shayliss’s neck twice over, which is something she did not want to think about. In the woman’s normal hand was a scythe that had seen battle by its blade’s wear and tear. The third form was nearly transparent, making Shayliss think that it was a sending rather than a physical form. She was the textbook image of a succubus: dark hair, blood red skin, curvy feminine form and demonic wings that stretched for miles. Despite floating, she was in a sitting position with legs crossed and hand under her chin. All three of them were looking at the group now within the chamber. The minotaur was ready to charge forward, his nostrils flaring with every heavy breath. Succubus was giving all of them an appraising look, as if she was about to buy one of them from an auction. The middle demon, however, gave them all a look of pure terror. Was she really afraid of them? Or was it something else? The middle demon, Jeslyn, turned her head to face the succubus and gave her a shaky nod. She then turned to face the group and bared her scythe diagonally across her body, blade toward the ground. There was going to be no dramatic dialogue. No hesitation. No way to tell of any weakness besides what they already found. The fight was about to start and it was going to be bloody. There was no time for her to see if they understood. Before she had finished her orders, the minotaur let out a snarl deep enough to shake the whole room and charged right for them. Mordria saw that and slid herself in front of the minotaur. Again, there was an energy that emanated from her body as she grabbed onto the bull-man’s horns. Her strength was able to stop his charge, sliding a couple of inches and leaving gouges into the stone. Once their momentum halted, Mordria let out a yell and started pushing forward, overpowering the bull and moving him toward the side of the room. Snaga, on the other hand, had moved on Jeslyn, who had tried to sneak around the minotaur/tiefling pair. He leaped forward, low to the ground, and lashed out with a swift right hook. The scythe’s shaft creaked under that force, somehow staying intact. Jeslyn let out a yell and shoved the half-orc back. As he stumbled, Jeslyn turned toward Strune and slid her foot backward to launch herself forward. Snaga’s body let out a pulse of pure force and seemed to blur. His hands stretched out, grabbed the woman’s armor, and pulled her back toward him. She recovered quickly, though, and swept her scythe out. The pair were too close for the attack to be a great one, but the wood of the weapon crashed into Snaga’s temple, nearly sending him to the ground. Again, Jeslyn tried to launch for Strune and this time Snaga was too stunned to try and stop her. Shayliss’s stomach fell hard as the woman managed to cross the distance between her and the strix in a second. She wondered how they were supposed to combat such speed, and how the woman could move so well despite her ankle. It was near god-like. Shayliss was not sure how she did it, but the loyal half-orc paladin of Iomedae interposed herself between Jeslyn and her target. Scythe met shield in a shower of sparks that flared like a firework. Irabeth did not stumble backward or slide from the blow. Instead, she held her ground and thrust her shield forward, bashing Jeslyn in the torso. Jeslyn, unable to do anything about it, arced backward from the group remaining at the door and landed with one foot and massive claw digging hard into the stone. Irabeth rushed forward, her line of motion as straight as an arrow, and slid the last bit of distance to swing her longsword in a diagonal slash downward. Jeslyn thrust her claw arm forward, effectively blocking the blade with the limb’s exoskeleton. She then swung her scythe in an awkward one-handed swing. The blade left a long shallow line in Irabeth’s arm between two armor plates, sundering chain-links and leaving a bleeding gash. As if he could smell her blood, the minotaur flung Mordira, who had taken him at the complete opposite end of the room, against the wall. The tiefling crashed hard against the stone, sending cracks webbing for feet, and fell limply to the ground. The bull prepared to bull-rush right for Irabeth, digging into the stone with his back hoof. 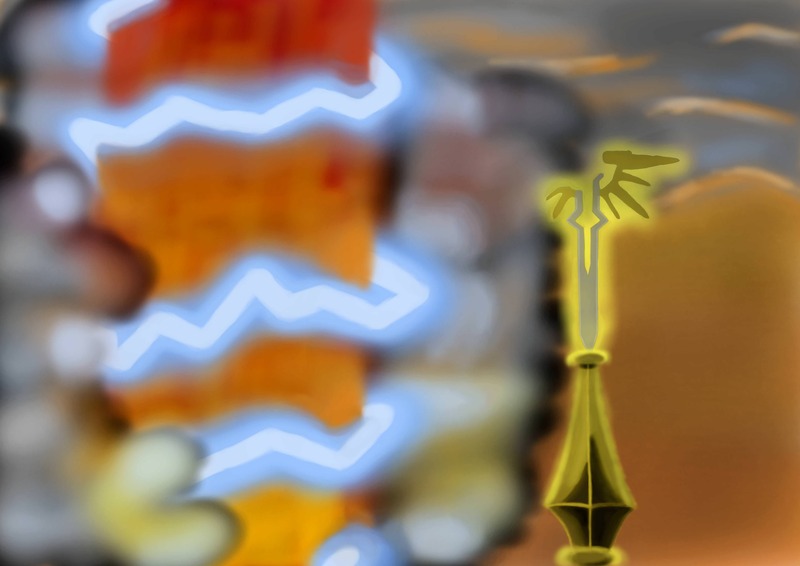 However, before he could, a white blur followed quickly by an arrow made of pure holy energy tackled him. Blueeye did not wait for his momentum to stop him. As soon as he had his paws back on the ground, he flung himself at the minotaur again, making a narrow angle with his line of attack. Fangs bit deep into the minotaur’s side and the bull let out a howl of pain. Yet, the injuries from wolf and arrow did not seem to affect him as he spun to swing his horns at the smaller beast. There was a yelp from Blueeye and while he did not hit the wall like Mordira, he was stunned for a second. As the minotaur was turning to finish off Blueeye, more arrows of light started raining down upon it. While most of them missed, most likely due to hasty firing, there were two that sunk deep into the minotaur’s fur before disappearing in a burst of light. The minotaur looked behind it to find Kaira, her quiver glowing with divine power, aiming two more arrows at it. It let out another earth-shaking roar and ran in an arc, his body mass preventing a sharp turn, to aim himself at the woman. Kaira waited for him to straighten out and charge right for her before letting loose with the arrows of light. They sailed through the air, acting like normal arrows, and slammed hard into the bull-man’s head. The impact caused a stutter step in the bull’s motion and he had to slide for a bit, shaking his head as if to throw out the arrows, before course correcting himself and running again. During that brief moment of hesitation, Mordria advanced on him. When she reached his side, she dug her claws into him, used that as a means to flip herself over him, and slashed his other side on her way back down. Shayliss was just staring at the two fights, her longsword and grappling hook at the ready. What was happening? Granted, all of her allies were excellent fighters, even during the mess in Varisia. But they had never gone all out like this before. They should have been exhausted to the point of collapsing like she was. Yet, they pushed on past that to finish the fight. Was it just that they never took off the cuffs before? Or was Irabeth right? Was Iomedae really watching over them? Either way, they had given Strune the chance she needed. Shayliss traded a look with Strune and prepared to run forward with Strune. As soon as she took that first step, though, a burst of wind slammed her back and Strune flung herself forward, bolting like lightning toward the Wardstone Fragment. Jeslyn saw that and shoved the two half-orcs aside with two scythe swings. The pair had no chance to do anything other than defend themselves with gauntlet and shield. Using their brief moment of hesitation, the half-elf-demon launched herself forward, her speed still amazing. The now somewhat familiar burst of power flew from her and into the airborne woman. Strune apparently did not even need to look. She just tilted her body to the left, sending her flight curving to the left and around the Wardstone. Jeslyn’s scythe snapped chain links but did not deal any more damage. Strune let out a grunt of effort as she gave herself enough room to charge right for the Wardstone. And there was no one able to stop her. She thrust the Rod of Cancellation toward the Wardstone.